The hum of the lightsaber in the classic Star Wars movie is so iconic that kids play-fighting with their pretend ones make sure that they make the sound too. The other sounds that created a soundscape for the movie was the deep breathing of Darth Vader, and the electronic voice of R2-D2. All of these are sound designer Ben Burtt’s historic contributions to Star Wars. As a child growing up in New York, Ben Burtt recorded sounds off the television set. Playing these recordings back was his way of re-experiencing his favorite movies. Westerns and sci-fi were his favourite movies. When he realized that recording in a movie theater picked up too much unwanted background noise, he switched to the drive-in, rigging his recorder and microphone into the speaker. Eventually his fascination with cinema and sound led him to attend the U.S.C. School of Cinematic Arts on scholarship, with aspirations of becoming a filmmaker. In order to earn some extra money, he took a job as a sound editor, working on trailers and Roger Corman’s Death Race 2000, and became known for his skills in the sound department. When George Lucas began work on what would eventually become Star Wars, Walter Murch, who’d created sounds for THX 1138 and American Graffiti, was contacted but was unavailable. Burtt was contacted and enlisted to find the sounds for Chewbacca. 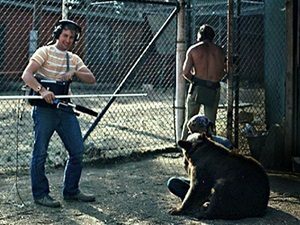 With the principal ingredient of the final sound being that of the mournful whine of a young cinnamon bear at a ranch in Tehachapi, he created the sound for Chewbacca by blending dog, lion, seal, walrus, tiger, camel, and badger sounds. The brief that George Lucas gave Ben Burtt was to leave aside the slick sounds that science fiction movies were typically known for, and instead create audio that would lend realism to his epic space opera. Lucas’s script was littered with sound moments, from the seemingly straightforward (“an explosion rocks the ship”) to the more perplexing (“the little dwarf robot makes a series of electronic sounds that only another robot could understand”), which Burtt set out to track. For almost two years, using a bulky, 25-pound Nagra tape recorder, Ben roamed around Los Angeles, completing about 200 distinct sound projects, marking his ‘sound finds’ on a large map he still has to this day. They included a “hum hum” in Canoga Park, a “chuga chuga” in Ridgecrest, a “blam titzow” in Angeles National Forest, a “mroow,” and a “zoom” at small airports in Buena Park and Orange County. The trumpet of an elephant became the shriek of a TIE fighter; a high-tension wire struck with a hammer became the zaps of a blaster. The biggest challenge Burtt faced was creating a voice for the chatty droid R2-D2. 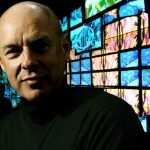 Over six months, Burtt experimented with processing his own voice and tinkered with an ARP 2600 analog synthesizer, splicing together a suite of polysyllabic expressive bleeps, bloops, chirps, whistles, burps, farts, sighs, and squeals, till he got it to sound just right. On the other hand, the sound of the lightsaber was relatively easy. He combined the buzz of an old television set with the drone of a couple of old film projectors. The dramatic pitch-shifts were generated by waving a microphone at a speaker and letting the Doppler effect do the rest. Lightsaber sounds have been made the same way ever since. Besides these recognisable sounds, Burtt lay down the banal ambient noise of any scene, managing to make even the air-conditioning in the corridors of the Death Star sound volatile and ominous. The result: Star Wars’ specially customized soundscape was unlike any science fiction movie before it, it sounded other-worldly and felt organic. It was a quantum leap for movie sound design which, at that point in history, had rarely involved more than rattling a piece of sheet metal to imitate thunder. Star Wars opened in theaters on May 25, 1977, and the following year, Burtt’s aural inventions were honored by the Academy of Motion Picture Arts and Sciences. 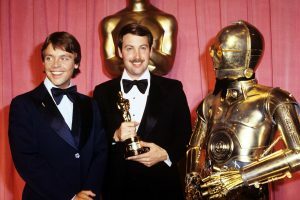 He received a Special Achievement Award for sound effects, for the “creation of the alien, creature and robot voices.” After the astounding response to the movie, Burtt’s creations became as essential to the soundtrack of Star Wars as the music of John Williams. By the time that Return of the Jedi was released, Burtt’s pioneering work had led to the creation of Skywalker Sound, a facility that today provides sound design, mixing, and audio postproduction for multiple movie projects a year, including some of Hollywood’s biggest blockbusters. During his 15-year tenure at Lucasfilm, Burtt earned eight Oscar nominations. He won for Star Wars, Raiders of the Lost Ark, E.T. and Indiana Jones and the Last Crusade. Burtt worked on the sounds for the Indiana Jones movies, the 2009 and 2013 Star Trek movies, Invasion of the Body Snatchers and Pixar’s Wall-E. In the latter film, he ‘voiced’ the title character, Wall-E, and also created the robotic sound of Wall-E’s voice, along with all the other characters in WALL-E. He was the sound editor of the movie. Another of Burtt’s subtle, yet highly effective sound effects is the “audio black hole.” In Attack of the Clones, Burtt’s use of the audio black hole involved the insertion of a short interval of absolute silence in the audio track, just prior to the detonation of ‘seismic charges’ fired at the escaping Jedi spaceship. The effect of this second or less of silence works to accentuate the resulting explosion in the mind of the listener. Ben Burtt eventually went on to become an editor, director and writer but he is still best known for his work as a sound designer. One of his directing ventures was the 1990 IMAX film Blue Planet. Ben is also the one who created the title ‘Sound Designer’ when he realized his work on ‘Star Wars’ did not truly fit any of the traditional sound roles, creating thousands of fans for himself among his sound community. Speaking about his work, he is quoted as saying that he never found it to be a relaxing career except when he was out recording things. Getting out of the studio introduced fun and adventure into his day.